This chapter starts off with an ethnic/territorial perspective on the history of nationalism. 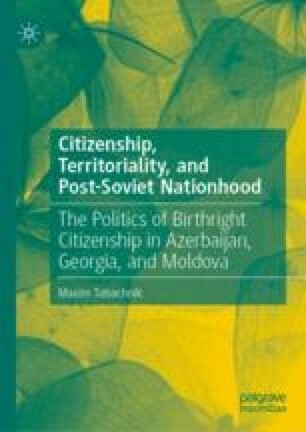 Then, it gives a brief historical overview of the institution of citizenship from its origins in Western antiquity and to its peculiarities in the Russian Empire, the USSR, and today’s Russia. Finally, it ends with a historical overview of the birthright citizenship policy of jus soli. Brubaker, Rogers. 1996. Nationalism Reframed Nationhood and the National Question in the New Europe. Cambridge: Cambridge University Press. http://dx.doi.org/10.1017/CBO9780511558764, accessed February 14, 2014. Calhoun, Craig. 2005. Nationalism. In Encyclopedia of Social Theory. Thousand Oaks, CA: Sage. http://sk.sagepub.com/reference/socialtheory/n201.xml, accessed September 9, 2016. Carruthers, Bruce. 1996. City of Capital Politics and Markets in the English Financial Revolution. http://site.ebrary.com/id/10035822, accessed March 17, 2013. Carsaniga, Giovanni. 2012. The Globalisation of Academe: Myths and Reality. Arts: The Journal of the Sydney University Arts Association 23. http://ojs-prod.library.usyd.edu.au/index.php/ART/article/download/5604/6272, accessed October 17, 2013. Davis, Julie. 2018. President Wants to Use Executive Order to End Birthright Citizenship. New York Times. https://www.nytimes.com/2018/10/30/us/politics/trump-birthright-citizenship.html, accessed November 13, 2018. Feere, Jon. 2010. Birthright Citizenship in the United States: A Global Comparison. Center for Immigration Studies. http://www.cis.org/birthright-citizenship, accessed December 11, 2012. Grigas, Agnia. 2016. How Soft Power Works: Russian Passportization and Compatriot Policies Paved Way for Crimean Annexation and War in Donbas. Atlantic Council. http://www.atlanticcouncil.org/blogs/ukrainealert/how-soft-power-works-russian-passportization-and-compatriot-policies-paved-way-for-crimean-annexation-and-war-in-donbas, accessed April 22, 2017. Hollifield, James F. 1992. Immigrants, Markets, and States. Cambridge, Mass: Harvard University Press. http://www.hup.harvard.edu/catalog.php?isbn=9780674444232, accessed October 30, 2013. Honoré, Tony. 2008. From Constitutio Antoniniana to Constitutional Court. SSRN Scholarly Paper, ID 1270235. Rochester, NY: Social Science Research Network. https://papers.ssrn.com/abstract=1270235, accessed December 14, 2016. Masis, Julie. 2016. Russia Quietly Strips Emigres of Dual Citizenship. The Forward. http://forward.com/news/world/342136/russia-quietly-strips-emigres-of-dual-citizenship/, accessed April 29, 2017. Myhill, John. 2006. Language, Religion and National Identity in Europe and the Middle East: A Historical Study. Discourse Approaches to Politics, Society, and Culture, vol. 21. Amsterdam and Philadelphia: John Benjamins. http://site.ebrary.com/lib/ucsc/Doc?id=10132058, accessed February 21, 2013. Roşca, Ala. 2005. Strengthening Democracy and Interethnic Relations: The Moldovan Case. In Ethnobarometer in the Republic of Moldova. Pp. 53–80. Institute for Public Policy. http://www.ipp.md/libview.php?l=en&idc=163&id=76, accessed May 15, 2015. Smooha, Sammy. 2008. Comparative Citizenship: A Restrictive Turn in Europe and a Restrictive Regime in Israel: Response to Joppke. Law & Ethics of Human Rights 2(1). https://www.researchgate.net/publication/240793691_Comparative_Citizenship_A_Restrictive_Turn_in_Europe_and_a_Restrictive_Regime_in_Israel_Response_to_Joppke, accessed December 12, 2016. Soysal, Yasemin. 1998. Toward a Postnational Model of Membership. In The Citizenship Debates. Gershon Shafir, ed. Minneapolis: University of Minnesota Press. http://www.upress.umn.edu/book-division/books/the-citizenship-debates, accessed October 19, 2013. Tishkov, Valery. 1996. Post-Soviet Nationalism. http://valerytishkov.ru/cntnt/publikacii3/knigi/the_mind_a1/postsoviet.html, accessed April 3, 2016. Varga, Rada. 2012. Constitutio Antoniniana. Law and Individual In a Time of Change. In Ancient Civilisation: Political Institutions and Legal Regulation. Proceedings of the International Web Conference Conducted by the Centre for Classical Studies (Yaroslavl State University, Russia) in 2011/12. Pp. 199–229. Yaroslavl, Russia: Yaroslavl State University. http://www.academia.edu/4306768/Constitutio_Antoniniana._Law_and_individual_in_a_time_of_change, accessed December 15, 2016. Weber, Eugen. 1976. Peasants into Frenchmen—The Modernization of Rural France, 1870–1914. ACLS Humanities E-Book. http://hdl.handle.net/2027/heb.01321, accessed March 12, 2014. Weil, Patrick. 2002. L’accès à La Citoyenneté: Une Comparaison de Vingt-Cinq Lois Sur La Nationalité. http://www.patrick-weil.fr/wp-content/uploads/2014/07/2002-Lacc%C3%A8s-%C3%A0-la-citoyennet%C3%A9.pdf, accessed December 13, 2016. Aйpyмян, Haиpa. 2008. Hoвый Зaкoн “O Гpaждaнcтвe” Haгopнoгo Кapaбaxa Пpeдycмaтpивaeт Инcтитyт Двoйнoгo Гpaждaнcтвa. Кaвкaзcкий Узeл. http://www.kavkaz-uzel.eu/articles/145997/, accessed December 14, 2016. Зyбoв, Гeннaдий. 2017. Poccиян Oпpeдeлят Пo Пoчвe. Гaзeтa.Py. https://news.rambler.ru/articles/36310173-rossiyan-opredelyat-po-pochve/?updated=news, accessed April 29, 2017. Пpeдлaгaeтcя Упpocтить Пpoцeдypy Пpинятия Гpaждaнcтвa Для Hocитeлeй Pyccкoгo Языкa и Pyccкoй Кyльтypы. 2017. Russian State Duma. http://www.duma.gov.ru/news/273/1847713/?sphrase_id=2475752, accessed April 29, 2017. Cлoбoдян, Eлeнa. 2014. Ктo Moжeт Пoлyчить Poccийcкoe Гpaждaнcтвo в Упpoщённoм Пopядкe? AIF.RU. http://www.aif.ru/dontknows/actual/kto_mozhet_poluchit_rossiyskoe_grazhdanstvo_v_uproshchyonnom_poryadke, accessed April 29, 2017. Coвмecтнoe Зaявлeниe Bceмиpнoгo Кypyлтaя Бaшкиp и Bceмиpнoгo Кoнгpecca Taтap. 2009. Эpзaнь Macтop. http://www.erzia.saransk.ru/arhiv.php?n=2801&nom11=309, accessed June 11, 2016. Tишкoв, Baлepий. 2009. И pyccкий, и poccийcкий. Блoг B.A. Tишкoвa. http://valerytishkov.ru/cntnt/novye_publikacii/vatishkov_1.html, accessed June 9, 2016.